Kanga Collection of Printed Fabric from Kenya 100% Cotton Beach Sandals with rubber soles comes with a Kanga Travel Bag to carry your Sandals on Safari! Individual Hand Made in Kenya, East Africa, which makes them unique because they are made one at a time which gives them character. A bit of in sight on the Kanga (or Khanga Fabric from the old Bantu (Kiswahili) verb ku-kanga, to wrap or close), is a colorful garment similar to Kitenge, worn by women and occasionally by men throughout the African Great Lakes region. Khangas are also often referred to as Lesos. Kanga Collection supports a Non-Profit Organization, "Friends of Kenya Schools &amp; Wildlife" that supports education of children in rural schools in Kenya and though education helps them become advocates for Endangered African Wildlife. Working in partnership with communities they donate Educational Materials and Supplies to schools and supplement teacher's salaries. Provides funds and labor for construction and maintenance of schools and other community development projects. 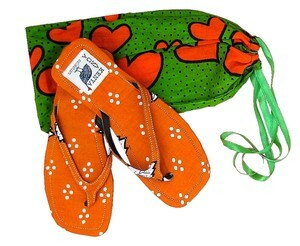 Beach Sandals Flat Slim Size 7 Bright Colorful Kanga Printed Fabric 100 % Cotton Sandals from Kenya East Africa Rubber Soles Individually Hand Made which makes them unique because they are made one at time which give them character. New!